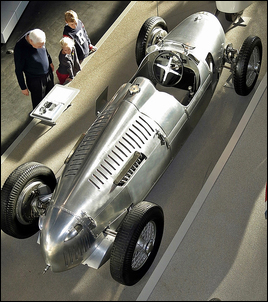 On May 27, 1934, the German racing cars that were soon to acquire the nickname “Silver Arrow” were entered for their first race, on the Avus racetrack in Berlin. Although neither Auto Union, the company from which Audi in its present-day form developed later, nor Mercedes Benz won that event, it was not long before these two manufacturers began to dominate international Grand Prix racing, a situation that prevailed until the outbreak of the Second World War in 1939. It seems almost incredible today, but by 1936 the Auto Union racing cars were reaching speeds of up to 380 km/h on the long straights of the Avus circuit – truly, the birth of a legend. The racing cars bearing the four-ring emblem were entered for the race to be held on Berlin’s Avus circuit on May 27, 1934. Driven by Hans Stuck, August Momberger and Hermann Prince zu Leiningen, this was their first appearance in competition. They were given a striking silver paint finish, but possibly their most remarkable feature was that the mid-engine location, with the engine located behind the driver. 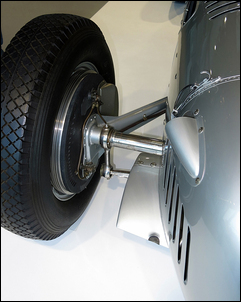 1934 was the first motor racing season in which the designers had to comply with a new formula: the cars were limited to a total dry weight of 750 kilograms (minus tyres), but the engines could be of any size and there was no restriction on the type of fuel. Ferdinand Porsche was the brain behind the Auto Union racing cars. He designed them for the new motor-vehicle manufacturing group of that name (created in 1932 by a merger of the Audi, DKW, Horch and Wanderer brands), and supervised their construction and testing from March 1933 onwards at Auto Union’s racing department, located at the Horch factory in Zwickau. Approval of his design was subject to the engines developing at least 250 horsepower at 4500 rpm. 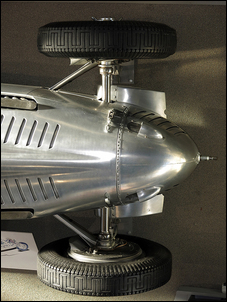 Driver Hans Stuck confirmed this with a world speed record run on the Avus circuit in March 1934. During the Avus race held shortly afterwards, the new Auto Union racing cars put up a most impressive show. Even during practice, Hans Stuck’s average lap speed of 245 km/h had made it clear who was the fastest contender. Although the race itself was held in heavy rain, Auto Union outpaced the other entrants (with Momberger recording the highest average speed of 225.8 km/h). By the tenth lap, Stuck had built up a whole minute’s lead over his nearest rivals – but then a fault developed. At the finishing line, Momberger was third, behind Alfa Romeo drivers Guy Moll and Achille Varzi. During this period, the basic design concept remained unchanged. 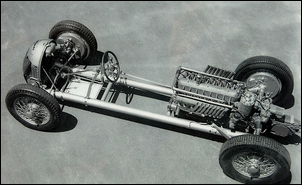 The 45 degree V16 engine was in the centre of the chassis, behind the driver’s seat. In its final form, the engine had a displacement of 6 litres and was extremely flexible: its maximum torque was developed at 2500 rpm, which meant that only a four-speed gearbox was necessary. Peak power was 520hp at 5000 rpm. The engine’s induction comprised twin side-draught carburettors and a Roots supercharger. Bore was 75.0mm and stroke 85.0mm. A single camshaft operated all 32 valves. 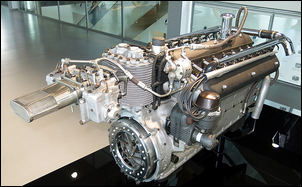 The crankshaft, originally a one-piece unit, was soon replaced by a version developed by Hirth, a specialist company. This consisted of individual segments bolted together through splined couplings. All the versions were built on ladder frames made from steel tubes in diameters ranging from 63 to 105mm (depending on the model version and the position of the frame section). The front independent suspension used twin trailing arms and the rear suspension, a swing-axle design. Porsche designer Erwin Komenda developed an extremely light weight (45kg) duralumnin body in two styles – long tail and short tail – for use on different racetracks. A number of changes were made to the body design during the car’s development. The most famous drivers of these cars were Bernd Rosemeyer, Hans Stuck, Hermann Paul Müller, Ernst von Delius, Rudolf Hasse and Achille Varzi. 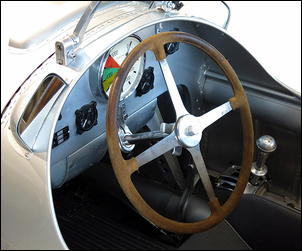 For the 1938 season, the formula changed and, since Ferdinand Porsche’s contract had terminated and he was no longer available, Chief Engineer Robert Eberan von Eberhorst drafted out a new design. 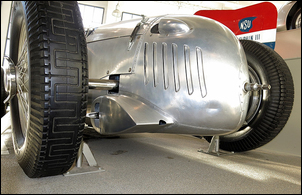 In 1935, a complete racing car cost about 50,000 Reichsmarks; four years later, the figure had risen to about 70,000 RM. A staff of approximately 60, including the race mechanics, was needed in the racing department, which was formed in 1933. Its members were specially chosen, in most cases from the workforce of the Horch factory in Zwickau, where the racing department was located. Between 1934 and 1939, Auto Union spent about 13.2 RM on Grand Prix racing, and received approximately 2.7 RM in subsidies from the government, an annual average of about 20 percent of its costs. 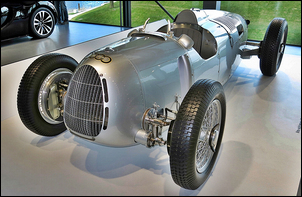 In those years, Auto Union entered for 61 circuit races in all, 30 of them Grand Prix events. It won 24 of the races for which it entered and also took 23 second and 17 third places. In 1934, 1936 and 1938 an Auto Union driver was German road racing champion. Truly, a wonderful race car.